Well here's a shiny development. 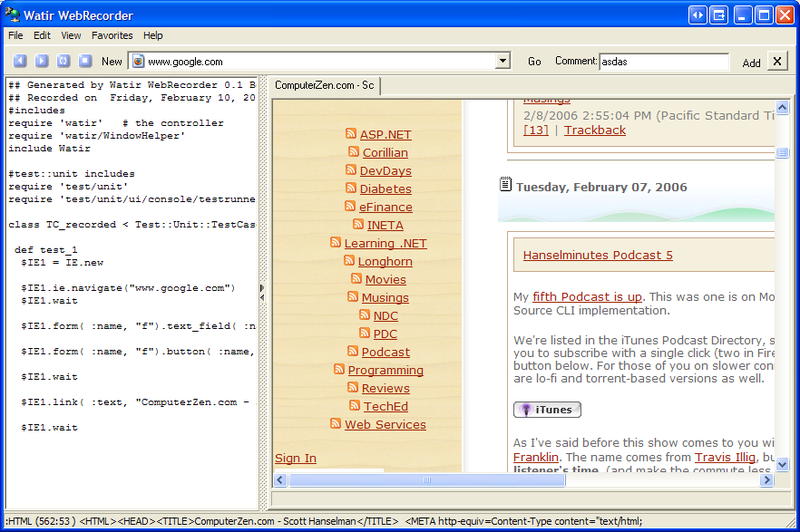 The folks at MJTNet have released a free version of the WebRecorder software that makes Watir code. It's beta 0.1, much as my own WatirMaker was (is). It does more than my spike does including support for server auth login boxes, popups and nested frames. Be sure to use the mouse to click things as it's a little touchy about using the keyboard, especially if you pressed Enter to submit a form. This (and WatirMaker) is a great way to jumpstart Watir development. I wouldn't recommend trying, assuming or thinking that you write all your tests with a tool like this, but it's a nice way to get started. We've ended up writing most of ours from scratch. I'm not sure why more people don't comment or talk about Watir on your site. 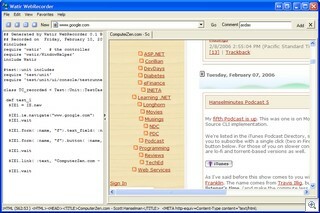 You got me so interested in it I started to use it personally and have since introduced it to our QA group. Now it's part of how we test. So anyway thanks for all the great information and hope you keep up the great content!